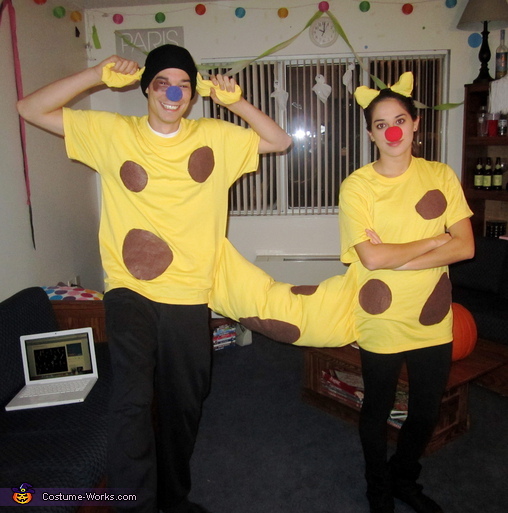 My boyfriend Ben & I dressed up as CatDog this halloween. We grew up in the '90s watching the show and knew all of our friends at college would love our idea! We bought 3 yellow t shirts and we each wore one. We sewed the third between our waists to make it look like we are connected. We stuffed the shirt between us with batting so it was soft and easy to carry around. We also bought brown felt for spots, which we also sewed on. To make the dog ears, we cut out leftover yellow t shirt into droopy ear shapes and sewed them to a plain black knit hat. For the cat ears, we attached ear shapes to a headband. We purchased two cheap clown noses and painted one to match the color of Dog's nose. We wore black on the bottom so people would just notice we were connected! We had a great time going out for Halloween! It was a commitment being attached all night but it was worth it! but how did you pee? Hi, I'm interested in buying this costume from you. Please let me know if you're interested in selling it.